Chances are you may be feeling a bit overwhelmed through the busyness of the holidays. Understandable. Don’t forget a gift for Aunt Sue. How many cookies do I have to bring for the office Christmas party? Who is hosting what party on which day? When is Sally’s Christmas play at school? How many teacher gifts do we need? What are we bringing to Mom’s house for Christmas dinner? What time is the Christmas Eve service? The list goes on and on until a mountain of to-dos starts swirling in your head and makes you want to shut out the world and skip Christmas altogether. But you can’t. Christmas is still coming, and your family and friends need you. So, come out of hiding and read this A to Z list for some great ideas on how to put yourself in the Christmas spirit (and avoid alienating your friends and family in the process). You are not an island unto yourself. Round up your posse and tackle your list! Do you have older kids who are out of school? Do your parents or in-laws have free time on their hands? Ask them to help cross something off your list. There’s nothing quite like the smell of fresh baked goods wafting through the house to put you in a good mood. Don’t want to feel guilty for consuming all those calories? Wrap some up and take them to a neighbor, a shut-in, or down to a homeless shelter. Lift someone else’s spirits and your own in the process. Grab your kids and put together a gingerbread house (don’t forget to eat some of those treats in the process! ), gather supplies and make a few Christmas ornaments with your family, or call some friends over and create Christmas cards to take to a local nursing home. Not into that creamy, frothy drink? Make some hot chocolate and top it off with marshmallows or whipped cream. Forget filling out a ton of Christmas cards; elfyourself! Visit this funny, festive site and load pictures of you and friends or family, which then puts your faces on dancing elves. You can’t help but laugh! Sitting around a warm fire pit on a cool winter night with good company can be quite therapeutic. Throw in some s’mores and it’s a party! ‘Tis the season of giving, so exercise that muscle and find creative ways to give to others like leaving an extra healthy tip for your server at lunch, give an extra offering at church for a missionary family, or surprise a friend with free babysitting so they can go out and get their shopping done. This may not seem important, but you need to keep your energy up by hydrating. While you’re at it, don’t forget to water the Christmas tree! Those dead pine needles can quickly take over your floor. A candle, that is! Just engaging your sense of smell by lighting a holiday/winter scented candle can lift just about any mood. When you’re driving down the road and you just don’t think you can handle one more Christmas song on the radio, but you hear your kids in the back seat belting out the familiar merry tune, throw caution to the wind and join in! Not only does this have the capacity to change your mood, it will most likely put a smile on your child’s face. And what’s better than that? Speaking of singing… you already know all the words, so why not invite some willing and festive friends over for a Christmas karaoke sing-off? You may not have time to go all out on decorating your house, but you can appreciate those who do. So grab your crew and go drive or walk through a neighborhood lights display. Or, go to a tree-lighting festival in town. Experiences are so much more fulfilling than things. Grab your family or a group of friends and go do something together like watch a movie in the theater on Christmas Eve. Save the cooking for another day and go out to a nice place for dinner. Go visit a theme park or other local attraction together. Don’t forget to build up your strength to accomplish your to-do list. Save some time (and calories) and try a smoothie. It’s great on the go, low in calories, and high in nutrients! Have a boat load of vacation time stored up? Why not use some of it? Even if you don’t actually GO anywhere, take a staycation to rest and reset, either before or after Christmas. Whether it’s a board game, a game of cards, or gaming on your Xbox, playing with a group of people can liven up anyone’s day. The true meaning of Christmas can get lost in the hustle and bustle of the season. Take some time alone with the Savior, meditating on His Word and thanking Him for all the blessings of another year. Make this an annual Christmas family tradition. Whether your kids are real little and just starting to understand what Christmas is all about, or if they’re a little older, reading together about Jesus’ birth should inspire us all. All it takes is one time down a hill on a good toboggan to make you feel like a kid again. Or just start a good old fashioned snowball fight. No snow where you are? Get outside and do SOMETHING. Live by the water? A little vitamin “sea” could be just what you need. It’s never good to isolate yourself over the holidays. So throw an impromptu soirée with a few close friends. Or, get to know your neighbors and set up a progressive Christmas dinner down your street. Is all your “stuff” getting too overwhelming and crushing your Christmas cheer? Believe it or not, some people find cleaning therapeutic. Chances are, you have to make room for new Christmas presents anyway, so cleaning away the clutter could help things feel a little less crazy this time of year. Sure, it’s nice to visit with friends and family during the holidays. But how about going to visit someone in a rehab facility or nursing home? Or head down to the local shelter and spend some time serving a hot meal and visiting with the folks there who sometimes just want to know someone will listen and care. Grab some popcorn or maybe hot cocoa and settle in for a Christmas movie marathon. Not sure what to watch? Just Google “Top Christmas movies” and a plethora of excellent choices awaits you. Ok, so this one is a stretch. BUT, it could do you some good to get out and do something new this Christmas. Never been to a play? Go see a local production of A Christmas Carol. Want to save money this year? How about trying your hand at making some Christmas gifts for those on your list? Even if you’re not feeling so festive, sometimes you gotta fake it till you make it! Go Christmas caroling. In fact, enlist a couple friends and strike up a Christmas flash mob while you’re out somewhere. Others are sure to join in! Don’t get so distracted by those things that don’t really matter. It’s easy to get caught up in way too many details and cramming in too many things. Zone in on what matters the most. Amidst all the chaos this season can bring, take some time to pause and evaluate what’s truly important. Maybe you don’t struggle during the Christmas season but know someone who does – why not share this post so it can bless someone who might be overwhelmed. 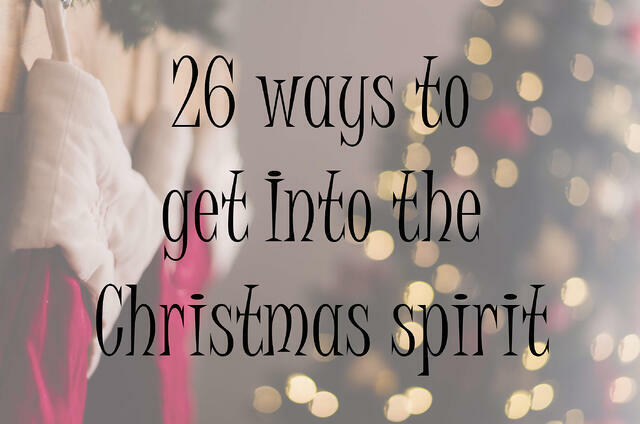 Here are 26 ways to get anyone in the holiday spirit!